Marisa Silver’s beguiling new novel, “Little Nothing,” is a powerful exploration of the relationship between our changeable bodies and our just as malleable identities… Silver’s intellectual and emotional themes to accumulate with enviable subtlety. …a beautifully told, heart-rending, can’t-put-it-down read…Silver masterfully balances a riveting plot with deep meaning — exploring love and its inadequacies, the persistent and unequal power of sexuality, the cost of being an outcast in a fearfully conforming society. Pavla, born strangely disfigured, is the “little nothing” of the title; Danilo is the young local who loves her. All very conventional—and the only conventional things in this strange, glorious tale of transfiguration and wild nature. Trust me: you’ll have to read it to understand, but you’ll be transfixed. Silver, once a movie director, uses her trained eye to talk about the remarkable thing that is the female body—and how Western society misunderstands it. Little Nothing is a wild, witty, and mesmerizing tale that plays with the dissidence of bodies and the transcendence of longing. Marisa Silver writes beautiful, seductive prose that always manages to be both wise and fleet; her inventive, romantic novel is compassionate and moving in wonderfully surprising ways. A dark fairy tale that pulses with life and anger, Little Nothing is a remarkable piece of fiction – fantastically written and beautifully crafted…. The rage that courses through these pages is one that feels incredibly relevant, and elevates this story to something far greater than it could have been. Forget giving young girls Cinderella or Sleeping Beauty, but pass them this – it may be dark, it may be gruesome, but it conveys the anger of a woman shaped and molded by the pressures of society into something she has no desire to be, and the consequences of ignoring that rage and desire. A powerful read – 5 stars. Best-selling and award-winning author Silver (Mary Coin; The God of War) has created a haunting tale of magic realism, both fabulist and earthy. In Little Nothing, the wizardly Marisa Silver conjures a pitch-dark tale with empathy and humor. An emotionally suspenseful allegory, the novel reveals how the world’s expectations can torque a woman’s identity and leave a ferocious ache behind. The novel twisted me up inside. I loved it. Silver turns the oral tradition into fine literature with Little Nothing, a masterful work of fairy tale and folklore. LITTLE NOTHING is a siren call to self-acceptance, yet tells its story with a fantastical bent that will engage the reader. It’s a wild ride, one that combines literary skill and wages an emotional battle like no other. Little Nothing is a magnificent something, an inventive, unexpected story that seamlessly blends fable and folklore into the lives of characters who remain heart-wrenchingly real. That Silver wrestles with nearly unanswerable questions – What does it mean to occupy a body? What does it mean to be human? How transformative is love? – and still produces an exhilarating page-turner is a testament to her biting, beautiful prose. In addition to being a joy to read, this book challenged and changed me, and I can’t imagine what else anyone would want from a work of art. By turns haunting, fanciful, and poignant, Little Nothing is the latest example of why Marisa Silver is one of our finest, most protean storytellers. …a parable and a full-fledged, richly told story, with clearly drawn characters who beckon us to come along with them on their journeys… Silver shows us her capacity for fleet-footed writing. Little Nothing is a quick, pleasurable read, but one that’s full of mysteries to stop and unpack. Marisa Silver’s fantastically inventive new novel counters expectations at every turn. 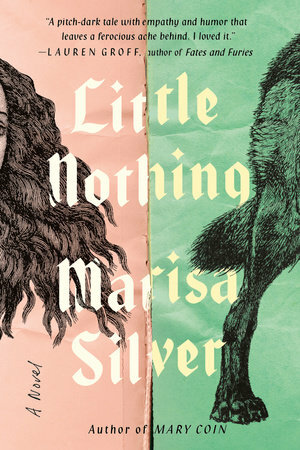 Marisa Silver’s fourth novel, Little Nothing, is a marvelous book…[it] is steeped in strangeness, but it’s driven by a basic question that frees the best novels and their heroes when the time comes to explore their worlds: What if there’s something else out there? Little Nothing is the key to its own box, which opens and opens, transcending the limits of the very tale one thought one was reading. There is no limit. There is only the vaporous wonder of transformation, and the kernel of a spirit of a thing that can go on, and does. This book is a beautifully realized riddle. With Little Nothing, the peerless Marisa Silver is at the height of her powers. Following one woman’s transformation, Little Nothing reimagines the boundaries between mother and child, human and non-human, possible and impossible. Lyrical, raw, and urgent, this exquisite novel will take you to the outermost edges of heart and mind. Part allegory, part fable, part love story, Little Nothing is unflinching, brutal, and yet exquisitely beautiful. This haunting and original novel—about the lengths people will go to escape persecution, the transformative power of compassion, and how one can find moments of grace and connection in a world filled with heartache—is unlike anything I’ve ever read before.